He may be hit or miss, but Cameron Crowe sure has it good. The dude makes bank directing scenes that seem to be conceived in terms of his own record collection, netting soundtrack contributions/allowances from venerable acts such as My Morning Jacket, Jeff Buckley, and even the act once-thought uncompromisable, Led Zeppelin. Say what you will about the quality of his films, but he usually delivers when it comes to tying songs into scenes. Of course this is best displayed in Almost Famous, wherein he makes unforgettable use of the likes of "Tiny Dancer" and "The Rain Song". If nothing else, it proves that songs can be effective in reinforcing emotion, or even serve as the catalyst for creating a moment in the first place (re: the "Tiny Dancer" scene.) The right song at the right time can make both physical and emotional elements that much more vivid. In this new feature I've dubbed "The Things You Can't Forget" (part of a brilliant lyric by the subject of our first account) I want to chronicle especially vivid memories that could have been culled from the silver screen. My parameters are loose, only that a particular memory was made indelible by the music that was playing at the time it occurred. My first entry is mined from my derelict Myspace blog, last updated sometime in 2007. I've refined and adapted it a bit, but the story remains the same. Without further ado! It was a weekday in spring of 2006 and I was awake at 5:30. And for the life of me, I couldn't get back to sleep. Uninterrupted slumber hadn't been an issue lately; in fact, it'd been more luxurious than usual because of my brand new bed. For the past two years I'd been sleeping, in the tradition of true collegiate resourcefulness, on a futon. At the behest of an ex-girlfriend who insisted I upgraded to a bed for my own spinal health and for that of future conquests (heh-heh-heh), I found a nice full-bed on Craigslist for a small sum. So because of the upgrade, I'd been sleeping like the dead; heavy, mouth-breathing slumber with vivid dreams from the moment I found my pillow to the second my alarm zinged to life. But this night, I couldn't sleep. Especially odd considering it was raining, a factor I'd assumed would only intensify my overnight coma. Despite the hour, I find it difficult to fade back asleep once I've been up for a while. So I flicked on my bedside lamp and struggled to my feet. I stood for a while in the middle of my room, clad it naught but boxer-briefs, locked in a dazed stupor. Eventually my gears started spinning. I turned on my computer (at that time it was an aging Dell Laptop that took ages to boot) and while it fired up I boiled some water for tea. I was raised on the stuff, and although I might have to cash in a man card for admitting it, I can't start my day without a steaming mugful. I toasted and gobbled an English Muffin while my tea steeped. I then brought my mug into my room and checked my e-mail, my news websites, etc. It was still raining; I could see it fall in front of the orange street lamp through my window. After the last slug of Earl Grey, I found some gym shorts and a T-shirt and laced up my running shoes. My bedside clock read "6:15" in cold, tall digital numbers. My plan was to meet Thomas at the gym at 7:30, but I decided I'd leave early and do my cardio before weights for a change. So I swiped the keys off the edge of the octopus tank stand (my roommate had an octopus) and stepped outside. It was chilly, maybe high 60s, and still a light rain. I hopped in my car and fired up my CD player, which at that time was a Sony Discman fed through my Jeep's tape-player. 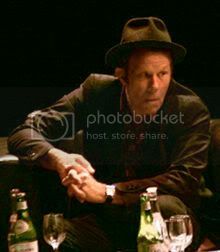 The CD was Nighthawks at the Diner by Tom Waits. I'd just bought it a few days before, and hadn't even listened to it a full time through. At this point I was still in my immersion process with Tom. It'd be a few years til I discovered the likes of Mule Variations and Bone Machine, but I was well-versed the early stuff. I drove through the darkness, the street lamps and traffic lights floating in the early morning dark. I noticed the song playing was a spoken word story of sorts called "Big Joe and Phantom 309", written by Tommy Faile. It's about a hitch-hiker getting a ride from a truck driver, the hitcher only later finding out that the driver was a ghost. He recites the words over a lightly plucked acoustic, a three-chord repetition that nicely complements the sad but sweet story. I decided to cut through Five Points, an area of Columbia famous for its abundance of bars, shops, and panhandlers. At the time I was largely repelled by the warea. It'd been under construction for years, and was generally a chaotic swirl of gridlock, filth, and douchebags. But as I rolled through it in the early morning darkness, with supply trucks parked in front of the bars, and the lights all green and orange, hazy in the misty rain, and my windshield wipers skidding through my eyes, all in the peaceful abandon that can only be found in the hours after last call and before first light, while Tom Waits spoke in his calming yet animated baritone, I saw Five Points in a way I'd never seen it. Just a quiet corner of a classic Southern town, not unwelcoming or trashy or vile. I suppose that morning, to the breathy rush of tires rolling through rain and the smoky charm of Tom's voice, I made peace with the area in some small way. At the gym I did 40 minutes of cardio, watching through the high windows as the western hills appeared in purple sky and the sun rose somewhere in the east. I also stepped up on the bench, and enjoyed one of my most satisfying workouts in ages. I drove back home the same route, but it wasn't quite so enjoyable. Traffic was stirring. Construction workers were crossing the street without regard for drivers, and my CD started skipping because of the torn pavement. But it didn't sour that early morning drive. And neither has the fact that the album is one of my least called upon Waits discs. There's a lot that makes it a special album, but the least of it is the songs. Still, "Big Joe and Phantom 309" is undoubtedly a timeless recording, and I'll think of that morning in Five Points any time I hear it. If you haven't had the pleasure of hearing Tom's famously captured performance of the song, I'd suggest you check it out on Grooveshark.com.